Esco has exhibited with a booth area at the Singapore Pavilion, in Hall 3. Medica 2015 was held on 16 – 19 November with 130,000 specialist visitors from around 120 nations with strikingly large number came from the foreign markets of the USA, Latin America and especially from Iran and countries located in the Arabic-speaking regions. 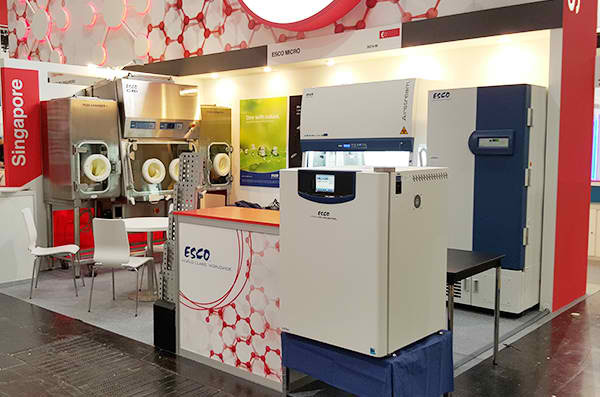 Esco has showed the new Airstream® AC2 TUV certified biological safety cabinet, CelSafe® 170L CO2 Incubator, Containment Barrier Isolator (CBI), Cell Cradle Bioreactor, Lexicon® Ultra Low Freezer and Versati® Laboratory Centrifuges. Visitors well-appreciated all products displayed, especially the CBI, Cell Cradle Bioreactor and the CelSafe® CO2 Incubator. This fair was doubly successful with interesting and prospective positive deals and partnership. We are grateful for all the visitors who meet us and we are looking forward to working with you and seeing you again next year.